Happy Wednesday! All That Scraps has a new challenge this week, it's time for ANYTHING GOES!!!! and the fabulous prize for one lucky winner is 5 CC Design digi stamps. Here's my card today, and this is what I look like in the mornings! Hehee! well almost... i do have a coffee cup with me! LOL! Coffee Kiki La Rue is getting herself ready for the day out with a good friend. Followed a great sketch from Mojo Monday. Papers are from BG new Plumeria, and colored cardstock from DCWV. Sparkles, twine and flowers for the finishing touch! Stop by ATS Challenge blog to see more inspiration from the team. Don't forget to check out the new June release, which will be available in the store for purchase Thursday night, June 7th at 8pm CST! Hi Mimi, What an adorable card. 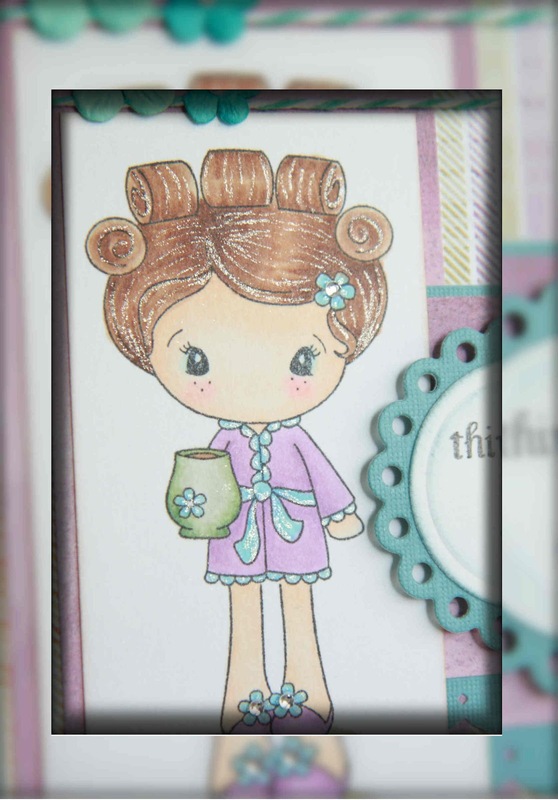 I don't have that image in my collection for some reason, humm... she is to cute with her rollers. By the way awesome header! Super sweet! Cute layout and coloring! Have a great weekend! this is so sweet, Mimi! love the pretty colors and details! Mimi, lovely image, great colouring.